The exceptionally tender, flavorful and somewhat expensive NY strip steak, also known as a Kansas City strip and top loin, is well-suited to broiling. 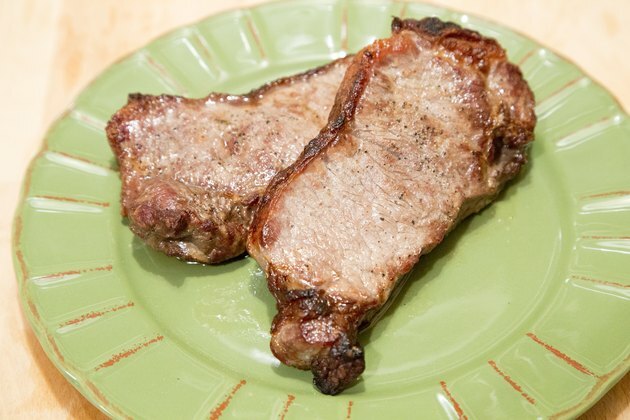 Unlike pan searing, broiling doesn't require a cooking fat like oil or butter, so it helps keep the calorie counter number and fat content down; that's beneficial when serving red meat, which is itself a bit high in both. This relatively quick, hands-off dry-heat method is a convenient way to cook such a naturally succulent, nicely marbled beef cut. Pat coarse kosher salt all over the steak about 45 minutes before broiling it. This provides enough time to draw out moisture and draw in flavor. 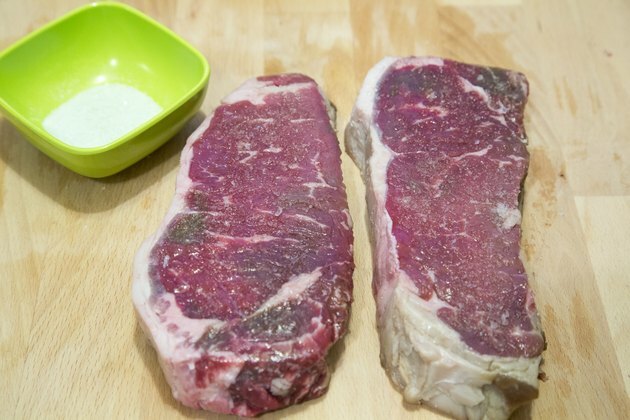 Coarse salt works well because it doesn't overpower the meat's natural flavor. 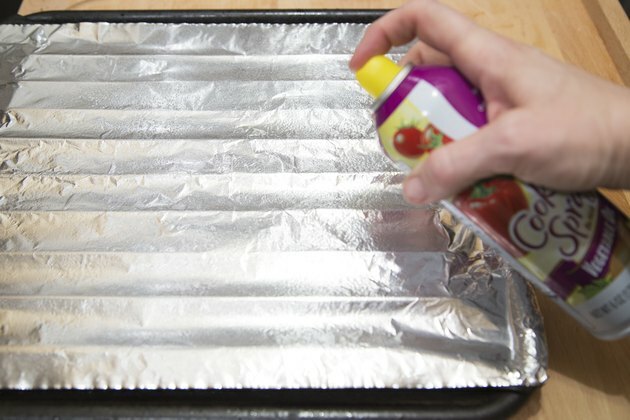 Line a pan with foil and give it a light coating of nonstick spray. Turn on your oven's broiler about 10 minutes before cooking. Season the strip steak to taste and place it on the pan. Freshly cracked black pepper, dried thyme, garlic powder or cayenne pepper powder are popular seasonings, and work best when used sparingly. Position the pan according to the thickness of the steak. 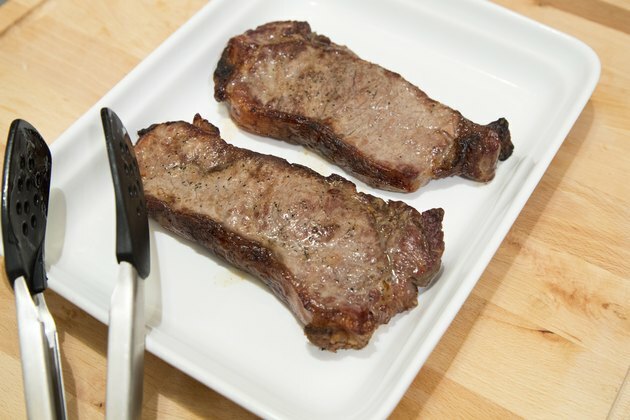 Place the surface of a 1-inch-thick steak 3 inches below the heating element; place a 1 1/2-inch steak 4 inches below the heat; and place a 2-inch cut 5 inches below the heat. Cook the meat according to your desired level of doneness, turning the meat over about halfway through its estimated cooking time. Broil a 1-inch-thick strip for about 11 minutes to 120 degrees Fahrenheit for rare; for about 13 minutes to 130 F for medium-rare; for around 15 minutes to 140 F for medium; for about 18 minutes to 150 F for medium-well; and for about 21 minutes to 160 F for well done. 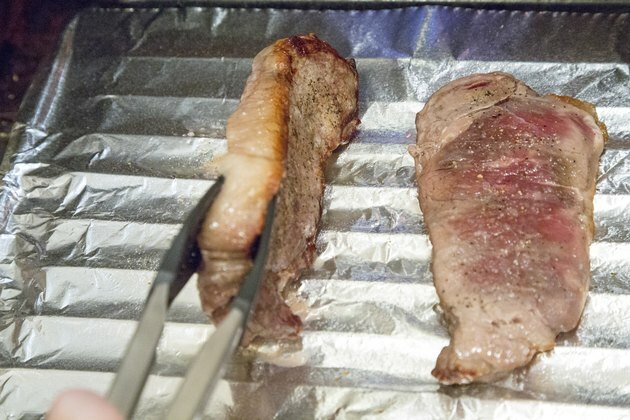 Insert a food thermometer into the steak's center to check doneness. Estimate longer cook times for thicker cuts. 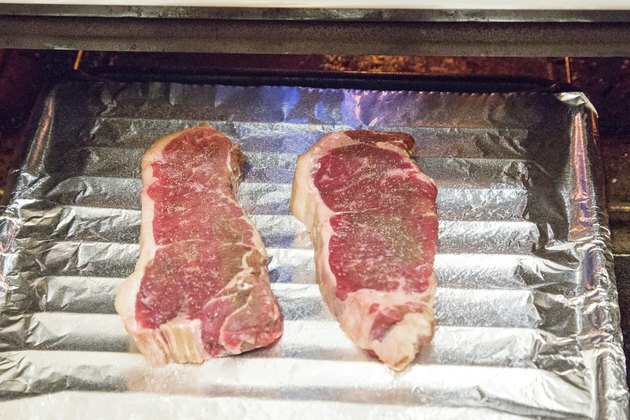 Move the steak off the broiler pan and onto a plate right away to prevent overcooking. Rest it for 5 to 10 minutes so the juices don't leak out of the meat when it's cut. 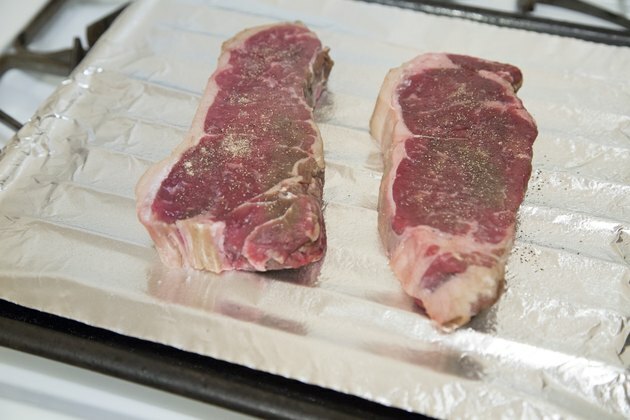 Many people opt to cook steak to their individual preference, but the USDA advises cooking solid beef cuts to 145 F.
If you have an electric oven, leave the oven door slightly ajar while running the broiler to prevent overheating and to prevent partially steaming the steak. Wash your hands with soap and water after handling the raw meat. Sanitize the surfaces and kitchen implements that came into contact with the uncooked beef before reusing them. Do not let meat sit out at room temperature for any longer than 2 hours. When it's hotter than 90 F, don't leave meat out longer than 1 hour.